We had a fabulous time last Thursday at our Cabernet, Canvas, and Color Workshop: Watercolor Leaves! 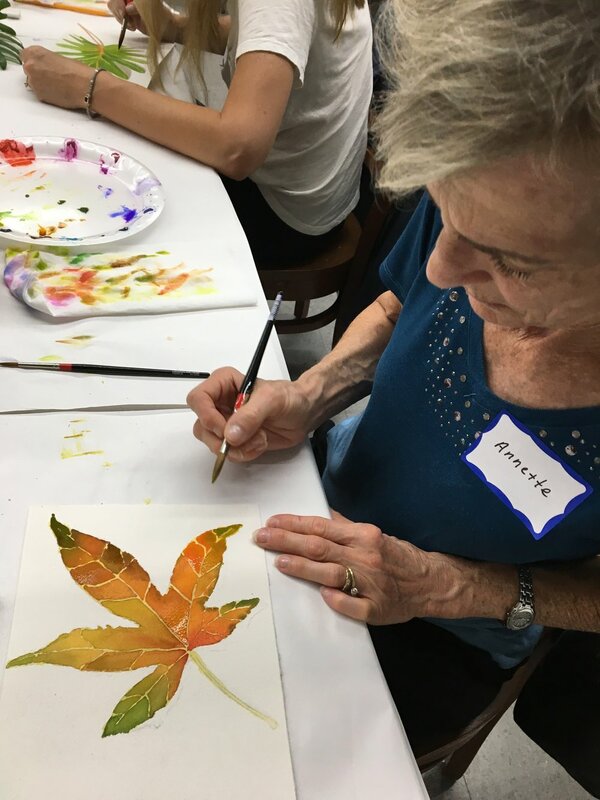 Attendees spent the evening enjoying light appetizers, wine, and wonderful art instruction by Lorelle Patterson - walking away with gorgeous fall leaves painted with watercolor. Posted on October 3, 2018 by Cordelia Miller and tagged Cabernet Canvas & Color Cabernet Night Art Trek Watercolor leaves art art workshop Newbury Park Thousand oaks. We had a fun and exciting Summer with all of our campers and counselors. Thank you to everyone who made it such a special time. Below you will find an array of art that campers created during their last week with us. From Spirit Animals to Shibori Butterflies & Dragonflies. They made it all! Summer Art Camp 2018 Gallery Coming Soon. Posted on August 1, 2018 by Cordelia Miller and tagged Art Trek Summer Art Camp Week 6 last week art Conejo Valley. #FlashbackFriday: Serve Day at Calvary Community Church! Calvary Community Church in Westlake Village invited Art Trek to participate in their Serve Day this past Saturday. Our wonderful staff members, Rose and John spent time creating Brilliant Blossoms and Fish in a Bubble with kids and families! Posted on June 16, 2017 by Cordelia Miller and tagged Art Trek Serve Day arts nonprofit non profit arts Calvary Community Church art fish in a bubble brillant blossoms. We had wonderful field trip with students from St.Aloysius School last Friday! Grades 2nd-8th joined us (144 students!) at our studio to create works of art to bring home to show all their friends and family. Their day consisted of creating Great Works inspired by artist Gabriella Denton, decorating clay critters with googly eyes, designing a mini zentangle and to wrap up a great day; some students hung out and had their lunch outside on the lawn and enjoyed the beautiful weather. Thank you St. Aloysius for bringing such a wonderful group of kids! We can't wait to have you back for another fun and exciting day! Posted on May 5, 2017 by Cordelia Miller and tagged Art Trek St. Aloysius teachers field trip students artwork Gabriellas mini zentangle clay critters with googly eyes clay critters art. $5 Friday | Chinese New Year! We all had so much fun this past Friday for our monthly $5 Friday: community art night! Many talented artists joined us on this rainy night and created some amazing works of art inspired by the Chinese New Year! Click here to check out more photos! Posted on January 26, 2017 by Cordelia Miller and tagged 5 dollar friday Art Trek Chinese New Year art community art night art night every 3rd Friday. We had a great teacher training last month! So many happy educators. Posted on October 14, 2016 by Cordelia Miller and tagged art trek 4 teachers training art gift of the arts art in classrooms art trek. Casa students getting creative during their weekly art program yesterday at our studio! Posted on June 10, 2016 by Cordelia Miller and tagged art art trek. Pick up your copy of 805 Living Magazine today and read all about Art Trek and many other local organizations in their "Give Thanks, Give Back" November Issue! You can find it at your local supermarkets; Gelson's, Vons, Ralphs and Albertsons in Santa Barbara and San Luis Obispo counties and Pavilion's and other high-end retail locations in Ventura, Santa Barbara and San Luis Obispo counties. Posted on November 7, 2015 by Cordelia Miller and tagged Art Trek 805 Living Magazine 805 art charity nonprofit organization give back. School is OUT next Wednesday! Art Day Camp is IN! Join Art Trek for Day Camp! All Students are welcome to join us for a lunch break between 12:30-1:00pm. CLICK THE FLYER TO REGISTER YOUR CHILD TODAY! Posted on November 4, 2015 by Cordelia Miller and tagged art trek art day camp veterans day camp art fun friends.